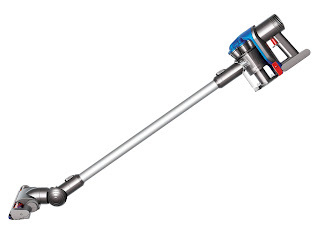 Introducing the Dyson DC35 Digital Slim! I've owned quite a few vacuums in my day. (You can actually tour our vacuum "graveyard" that we have in the garage.) I've heard the hype about Dyson, and was actually pretty stoked to get the opportunity to review one here at Lille Punkin' -- especially when I learned that it was the new Dyson DC35 Digital Slim. I had seen the commercials airing during my favorite late night southern crime drama (I guess I'm not the only housewife who watches the show), and was all giddy to think that one small, lightweight vacuum could have enough power to do all my dirty work on multiple surfaces. I'll be sharing more on the engineering of this product soon, along with my own experiences with the Dyson. Be sure to check back! Catch up with all the news on this unique product via Dyson's Twitter: @AskDysonUS and Facebook news... and, of course, you can find it at your local Walmart!